A Journey Back to Restoration - Welcome Authors! A Story of Healing and Forgiveness. A Story of Blessings, Peace, and Joy. 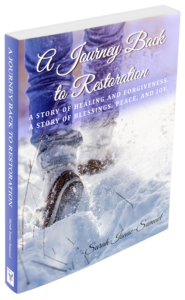 This book shares one woman’s journey from despair, abuse, and abandonment to peace, wholeness, and abiding faith. If you’ve ever wondered if true healing is possible, this story will assure you that it is not only possible, it is the gift awaiting you. healing, forgiveness, peace, and joy that she has found.